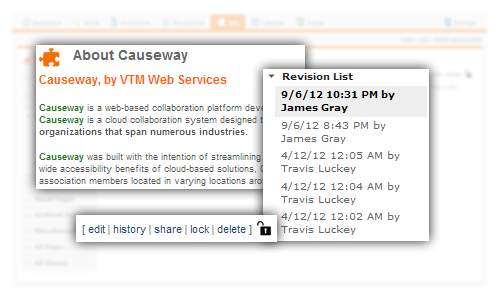 The Causeway Wiki feature provides users with an easily editable collaborative space. A wiki can be edited by anyone within a workgroup, and is a great place to collaborate on ideas without having to upload and download files or worry about cross-platform compatibility. As a wiki is edited, Causeway automatically stores previous revisions in its version history so committee members can easily look back at past edits to see how the wiki has evolved. Wikis can be grouped into categories and organized through a dynamic menu structure. Wikis provide a great space to collaborate on a topic before a final document is created and stored within the Documents module. They are also commonly used for creating frequently asked questions (FAQs) for new committee members.